La La Land convinced Fred Durst to host a magical jazz night in L.A.
Say what you will about La La Land, but apparently it’s convincing all sorts of people to get into jazz who otherwise never would have given it much thought. 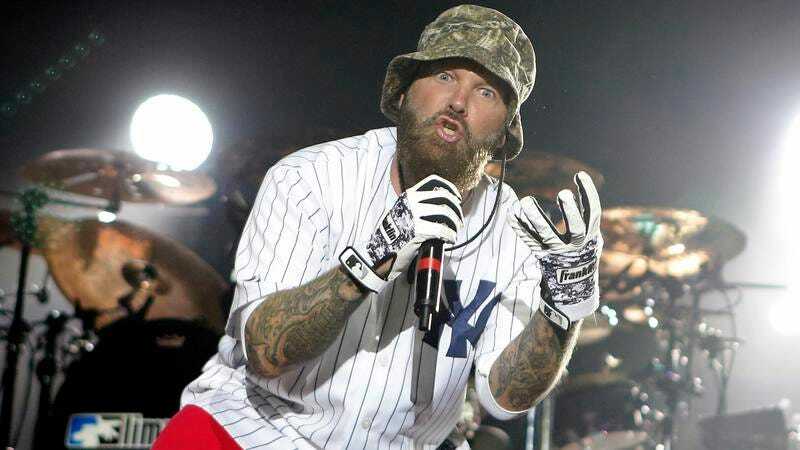 Unfortunately, it also got Limp Bizkit’s Fred Durst so into jazz that he’s probably going to kill the entire genre. That’s because, according to LA Weekly (via LAist), Durst has begun holding his very own reservation-only jazz night in Los Angeles called “Fred’z With A Z,” which he hosts while wearing a suit and his “signature red cap on backward.” But wait, there’s more: Fred’z is held every Thursday night at a bar called Black Rabbit Rose, which is—wait for it—all about magic. It has “flashy cocktails,” “magic-themed decor,” and magicians who perform little illusions in between acts during Durst’s jazz nights. Wait, did we say he was going to kill the entire genre? Because what we meant to say was that he’s making jazz cooler than it’s ever been and also that he’s putting on the best damn party Los Angeles has ever seen. Also, “Fred’z With A Z” is a great name. To Durst’s credit, he recognizes that it’s weird for him to host a jazz night and he understands why people would be concerned about him singing (in his words) “lounge versions of ‘Nookie’,” but he apparently started the event because it was just really important to him to have a reliable place in L.A. to hear musicians play jazz every week. Then, after La La Land became a hit, he figured the time was right to tap into the public’s sudden fondness for jazz music. As for the magic, Durst says he’s “not a fanatic” but he does think magic tricks are “very cool.” It sounds like he didn’t set out to start a weekly jazz club that also features magic, but it’s a “serendipitous collision” that brings a new layer of “How? !” and “Whoa!” to “Fred’z With A Z.” If you’re ready to say “how? !” and/or “whoa!” while listening to Fred Durst talk about jazz music, you can head to Black Rabbit Rose in Hollywood every Thursday.